The contest for the next Prosecutor of the International Criminal Court is down to 2. After informal consultations among States Parties, it was decided to narrow the list to two candidates: Ms. Fatou Bensouda (Gambia) and Mr. Mohamed Chande Othman (United Republic of Tanzania). 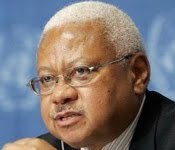 At the 1 December informal consultations, to be held in New York, States Parties will see if there is consensus on one candidate. Have never met Chief Justice Othman (above right), who, like Bensouda (above left) (credit), hails from Africa (a circumstance explored here.) But we 'Grrls have frequently posted about Bensouda. Yours truly has been honored to have hosted her visit to my former institution, California-Davis, to have participated in Chautaqua Dialogs with her, and to have engaged in a public Q&A with her at annual meeting of the American Society of International Law this past spring. 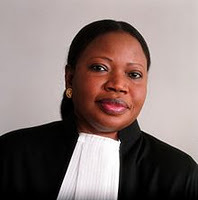 Bensouda's intelligence, acumen, passion, and wit are evident. And her understanding of the panoply of challenges facing the ICC in the next decade is unrivaled. If consensus continues to prove elusive even after this latest trimming of what was a short list of 4, the election context could play out openly on December 12. That's the date set for election of the Prosecutor, part of the Assembly's 9-day session at U.N. Headquarters in New York. The draft program for that session is here; preparatory documents available here. Also on the agenda: the election of 6 new ICC judges; debate on budget, ICC headquarters (source of some controversy, as this article indicates), and other matters; and side events, among them the December 13 launch of the Gender Report Card on the International Criminal Court 2011, by Women's Initiatives for Gender Justice, an organization some of whose leaders are IntLawGrrls guest alumnae, as well a December 20 session on "Challenges for the Next Prosecutor," hosted by Human Rights Watch.